Please note that the content of this book primarily consists of articles available from Wikipedia or other free sources online. Pages: 122. 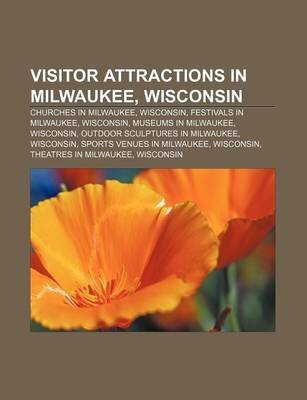 Chapters: Churches in Milwaukee, Wisconsin, Festivals in Milwaukee, Wisconsin, Museums in Milwaukee, Wisconsin, Outdoor sculptures in Milwaukee, Wisconsin, Sports venues in Milwaukee, Wisconsin, Theatres in Milwaukee, Wisconsin, Universities and colleges in Milwaukee, Wisconsin, Summerfest, Marquette University, University of Wisconsin-Milwaukee, List of public art in Milwaukee, Parks of Milwaukee, Milwaukee County Stadium, Miller Park, Milwaukee School of Engineering, Milwaukee Public Library, Forest Home Cemetery, Borchert Field, U.S. Cellular Arena, National-Louis University, Milwaukee Public Museum, First Stage Children's Theater, Milwaukee County Zoo, Wisconsin Lutheran College, Harley-Davidson Museum, Wisconsin Athletic Hall of Fame, Anime Milwaukee, Milwaukee Breakwater Light, Holler House, Bradley Center, St. Stanislaus Catholic Church, Basilica of St. Josaphat, Bryant & Stratton College, Milwaukee Pierhead Light, Wisconsin Workers Memorial, Henry Bergh, Medical College of Wisconsin, Midwest Ski Film Festival, Saint James Evangelical Lutheran Church of Milwaukee, Wisconsin, The Calling, Calvary Cemetery, Abraham Lincoln, Mitchell Park Horticultural Conservatory, Pettit National Ice Center, Cathedral of St. John the Evangelist, Music of Milwaukee, Milwaukee Theatre, Goethe-Schiller Monument, Cardinal Stritch University, Family, Stratiformis, Milwaukee-Downer College, Walkways Through the Wall, Denis Sullivan, The Victorious Charge, Count Casimir Pulaski, Wisconsin Conservatory of Music, Bronze Fonz, Chrysalis, George Washington, Great Double, Christian Wahl, Lloyd Street Grounds, Great Circus Parade, Milwaukee Institute of Art & Design, Havenwoods State Forest, St. Hedwig's, Woodland Indian and Whistling Swans, Alverno College, Thomas A. Greene Memorial Museum, Pabst Theater, The Hill Climber, R.D. Whitehead Monument, ..